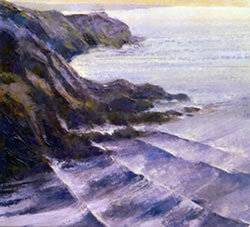 Hartland - Luminous Evening Light In September the Walker Galleries in Sidbury are staging an exhibition of paintings by one of Devon's most prominent painters. Alan Cotton's exhibition, jointly arranged by David Walker and his London dealer David Messum, marks a return to his old painting haunts around the rugged north coast of Devon. As Alan's paintings grow richer and more varied in texture, he finds himself drawn to the sheer, craggy coastlines that are ideally suited to his particular vision. Laying on thick slabs of colour exclusively with painting knives, he recreates with remarkable physicality the contorted layers of sedimentary rock battered by the rise and fall of the tide. It was perhaps the vertiginous coastline of New Zealand, where he recently accompanied the Prince of Wales as his tour artist, that reminded him once again of the landscapes nearer home. 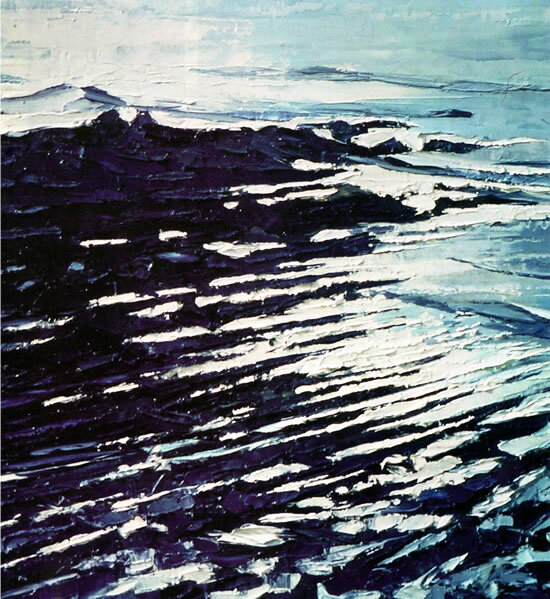 Although Alan's range is wide, encompassing many moods and climates - from the expansive sun-baked landscapes of the South of France and the soft misty slopes of Northern Italy to the cool, glimmering seas and stony fields of Ireland - it is perhaps where the elemental forces of rock and water meet that his work is at its best. Hartland - Warm Evening LightAt heart a romantic, he is entranced by the forces of nature and the look of the earth he inhabits. He is now painting it with increasing inventiveness and passion. Alan Cotton moved to Devon from his home in the Midlands 40 years ago and for 12 years was senior lecturer in Art and Design at Rolle College in Exmouth. 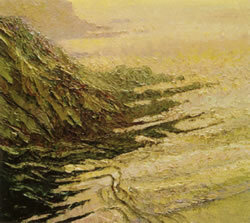 In 1982 he gave up teaching to paint full-time. Despite a couple of difficult years this proved to be an inspired decision, launching him into the public arena as a prolific and purposeful artist. His long and fruitful relationship with David Messum has ensured regular and frequent London exhibitions that invariably sell out, often even before the shows open. He has had many commissions nationwide and his work is in many public collections. But national prominence has not prevented him from promoting art in Devon. He likes to keep his finger on the local pulse, and to invite friends to see his work at small shows in his studio. He has been the leading light in the formation of the South West Academy and in organising its Children-in-schools and annual open exhibitions. His contribution to the arts in Devon has recently been rewarded with an honorary degree from Exeter University. 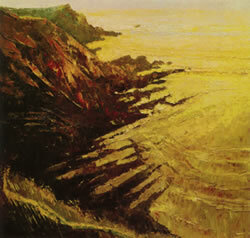 'The Hartland paintings are all painted from roughly the same view point, along the cliffs looking westwards. My idea was to study and paint the changing light at different times and seasons of the year, with of course a variety of tidal conditions,' Alan Cotton.